Seabourn Sojourn is an ultra-luxury cruise ship designed to offer a relaxed and sociable cruise experience. Seabourn Square replaces the conventional lobby of a cruise ship with an array of comfortable sofas, chairs and tables, making it the perfect area for socializing. Enjoy a coffee and a pastry or treat yourself to some gelato while you relax on one of the comfortable sofas. For the convenience of passengers, a concierge station with seated concierges is located right off the square, with staff waiting to help with any enquiries. The onboard boutiques are also located just around the corner from the square, offering designer jewellery, perfumes and more. Guests can also socialize with friends over a delicious meal on board Seabourn Sojourn as an impressive selection of culinary delights await. Choose between eight different types of luxury suites. Many of the suites boast a private balcony where you can where you can enjoy the perfect sunset, and all suites have separate living and sleeping areas and a bathroom with a bathtub. The finest cotton sheets, extra fluffy towels, granite bathrooms and large panoramic windows will make your stay extra special. Additionally, every guest will have a personal stewardess who will welcome you with Champagne and canapés, replenish your bar, and take care of any special requests. As with all Seabourn ships, fine dining will be a big part of your cruise. 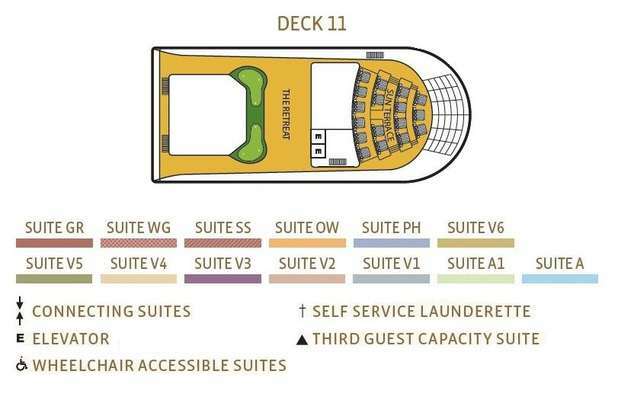 There are several options onboard the Seabourn Sojorn. In “The Restaurant” guests will fine elegant open dining with French-American appetizers, entrées and desserts inspired by chef Thomas Keller. “The Grill” offers timeless classics and table side preparation as well as an extensive wine and cocktail menu. Reservations close 15 days prior to sailing to make sure to get in touch with your cruise expert to secure your table. For an exciting evening, visit the casino and play blackjack, poker and roulette, or try your luck at the slot machines. The nightly entertainment is provided by a variety of musical artists, comedians, cabaret artists and DJs. The Club has the best drinks and live music during the day. At night the DJ plays the hits to fill the dance-floor. Why not try your luck at the casino where you can play blackjack, poker and other classic games? The Spa is one of the most popular areas on the Sojourn for guests to relax and unwind. Spend your day having massages, body wraps and other beauty therapies and enjoy the steam room and sauna. There are also various courses and activities such as yoga and the Mindful Living Program, created in collaboration with Dr. Andrew Wei. During the day casual clothing is recommended. For evening wear, casually elegant outfits are most appropriate. For the optional formal nights, it is recommended that men wear a tuxedo and women wear a cocktail dress. On these evenings, jeans are not allowed in the lounges or restaurants. Depending on your destination, choice of clothing varies for shore excursions. Persons under the age of 18 must be accompanied by a person over 21 years to take a cruise on the Seabourn Sojourn. If you are searching for a hassle free, luxury cruise to incredible destinations, then a cruise on the Seabourn Sojourn is the perfect choice. Everything on board is of the highest standard, yet the atmosphere is relaxed and offers you the perfect holiday feeling. This stunning ship fromSeabourn is sister to the Seabourn Odyssey and Seabourn Quest, the Sojourn offers many of the great features which made those ships so popular, and more. 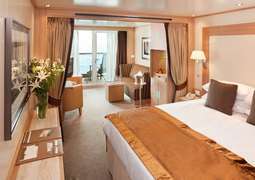 The suites on board feel more like a luxury hotel than typical ship accommodation. 90% of the suites on the Sojourn boast balconies and all have distinguished living and sleeping areas, as well as beautifully appointed bathrooms fitted out in marble and accompanied with your personal choice of luxury soaps. In your suites you can enjoy your own choice of spirits, wine and beer, as well as offering plenty of storage space, such as a walk in wardrobe. 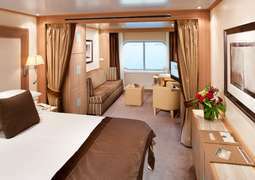 As well as fantastic and opulent suites, the public areas on board are notable for their variety, comfort and number. The Sojourn features an expansive deck area with plenty of welcoming lounge chairs on which to relax. On board you will find whirlpools and swimming pools as well as The Retreat, an area for recreation where you could enjoy a game of shuffleboard or practice putting on the golf green. The main restaurant on board, the Colonnade, features a wraparound terrace and alfresco dining options. It is a top quality buffet style restaurant with the finest service and delicious food for every meal. There is also Restaurant 2, where you can try an intriguing array of ingredients and dishes. Passengers could alternatively dine in the privacy of their suite. Another highlight is the Observation Bar, found on Deck 11, offering 270 degree views of the seas accompanied by entertainment and your choice of beverage. The Seabourn Sojourn also features an expansive fitness area as well as boasting the largest spa of any ultra-luxury ship at sea. In the fitness area you could work out at a range of machines or take part in complimentary classes of Yoga, Tai Chi or Pilates. In the incredible spa area there is a world of pampering, indulgence and relaxation just waiting to be discovered. Using all natural ingredients the staff will treat you to a range of facials, massages body treatments and wraps, which will leave you feeling utterly pampered. There is also a thermal lounge suite, a hydro pool with massaging jets, a water therapy system as well as the option to enjoy your own personalised spa package in your very own spa villa, a private retreat where you can escape and indulge yourself completely. The Spa at Seabourn is sure to be a standout of your stay on board and is well worth a visit.